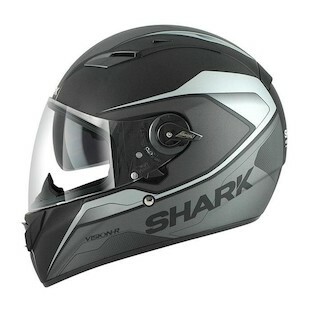 The Shark Vision-R in the new line of helmets from Shark Helmets, is universally suited for a wide range of purposes: fit, functionality and a mix of technology which should appeal to most riders looking for a premium helmet. It has a fiberglass shell, intermediate oval head-shape, lightweight (3.8 oz. ), chin vent, rapid anti-fog, anti-scratch shield, chimney vent with four different exhaust ports, eps liner-the shark fin system an innovation over other manufacturers. With a panoramic aperture, the Shark Vision-R has a heavy duty polycarbonate faceshield with an auto seal system for better soundproofing with a city position crack for a breath of air and fog protection. While it's not a quick change shield, you do get a smoked built-in sun visor. As with the rest of this Shark helmet line there are a range of 6 different optional cheek pads if needed with easy-fit glasses system. All these helmets are also predisposed to Sharktooth communication systems, a neoprene chin curtain wind collar and double-d ring connection. The Shark Vision-R is available in Shark Vision-R BeCool Lumi, Shark Vision-R BeCool, Shark Vision-R Solid, Shark Vision-R Syntic, Shark Vision-R High Visibility, and the Shark Vision-R Stripes. 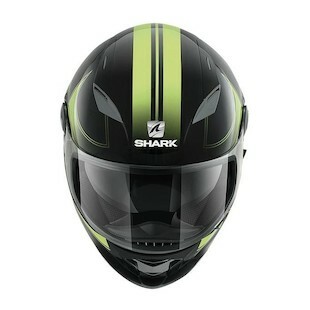 Be sure to check out the rest of the options out there by visiting our sportbike helmets page.